A Cyclase IX Polyclonal Antibody detects endogenous levels of A Cyclase IX protein. 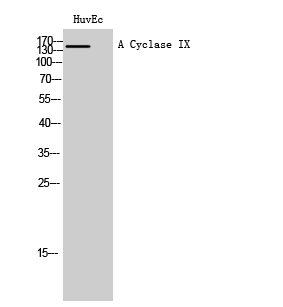 Synthesized peptide derived from the N-terminal region of human A Cyclase IX. Small volumes of anti-ADCY9 antibody vial(s) may occasionally become entrapped in the seal of the product vial during shipment and storage. If necessary, briefly centrifuge the vial on a tabletop centrifuge to dislodge any liquid in the container`s cap. Certain products may require to ship with dry ice and additional dry ice fee may apply. NCBI/Uniprot data below describe general gene information for ADCY9. It may not necessarily be applicable to this product. ADCY9: May play a fundamental role in situations where fine interplay between intracellular calcium and cAMP determines the cellular function. May be a physiologically relevant docking site for calcineurin. Belongs to the adenylyl cyclase class-4/guanylyl cyclase family. 1. The importance of miR-181a-mediated AC9 downregulation in acute promyelocytic leukemia, is reported.